This groundbreaking collection by the most distinguished musicologists and film scholars in their fields gives long overdue recognition to music as equal to the image in shaping the experience of film. Refuting the familiar idea that music serves as an unnoticed prop for narrative, these essays demonstrate that music is a fully imagined and active power in the worlds of film. Even where films do give it a supporting role—and many do much more—music makes an independent contribution. 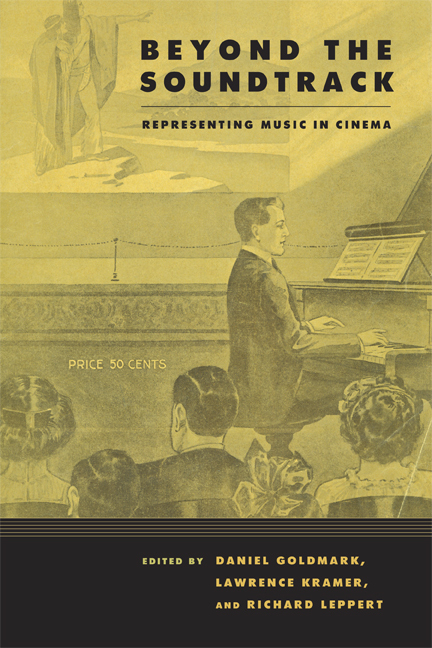 Drawing on recent advances in musicology and cinema studies, Beyond the Soundtrack interprets the cinematic representation of music with unprecedented richness. The authors cover a broad range of narrative films, from the "silent" era (not so silent) to the present. Once we think beyond the soundtrack, this volume shows, there is no unheard music in cinema. Daniel Goldmark is Assistant Professor of Music History at Case Western Reserve University. He is the author of Tunes for 'Toons: Music and the Hollywood Cartoon. Lawrence Kramer is Professor of English and Music at Fordham University and editor of 19th Century Music. His many books include Opera and Modern Culture, Musical Meaning: Toward a Critical History, and Why Classical Music Still Matters. Richard Leppert is Morse Alumni Distinguished Teaching Professor in Cultural Studies and Comparative Literature at the University of Minnesota. His many books include Theodor W. Adorno: Essays on Music, and The Sight of Sound: Music, Representation, and the History of the Body.